Luxury brand Frederique Constant officially unveiled its latest timepiece — the Hybrid Manufacture. The new watch is the first of its kind to merge mechanical movement with smartwatch features. The Hybrid Manufacture is similar to any other hybrid smartwatch with an analog watch face and underneath has all the smartwatch capabilities. But the one distinguishing factor is the way it works. Its timekeeping functions, including hours, minutes, seconds, and date, are completely mechanical and set by the crown. By using the pusher on the left side, you can control the electronic parts of the watch which enable the smartwatch functions. Normally, hybrid smartwatches run on a coin cell battery that typically last six months. With the Hybrid Manufacture, the time operates mechanically while the smartwatch functions are enabled by a battery. This means that even if the battery dies, you’ll simply be left with a self-winding mechanical watch that still tells time. As for the smartwatch battery, you’ll have to charge it once every seven days. When it comes to its smartwatch capabilities, the Hybrid Manufacture tracks sleep, steps, and calories burned using its dedicated phone app that you connect via Bluetooth. The sub-dial on the watch face also indicates your progress which you can see by pressing the left pusher. Through the app, you’ll receive detailed breakdowns and summaries of your activity. There’s also a ‘Dynamic Coach’ feature that provides tips to help you meet your health goals, along with an analysis of how you’re doing. Another helpful tool on the connected app involves the watch analytics — which give you detailed information on amplitude, rate, and beat error of the timepiece. That way, you’ll always be informed of when it’s time to service your watch by simply checking your phone. Aesthetically, the Hybrid Manufacture keeps it traditional. The 42mm case comes in either stainless steel with a black alligator strap or rose-gold plated stainless steel with a brown alligator strap. We had a few minutes of hands-on time with the smartwatch and thought it looked nice on the wrist — especially for a unisex timepiece. Even though 42 mm might be larger than most smartwatches out there for women, it didn’t look too big or bulky. 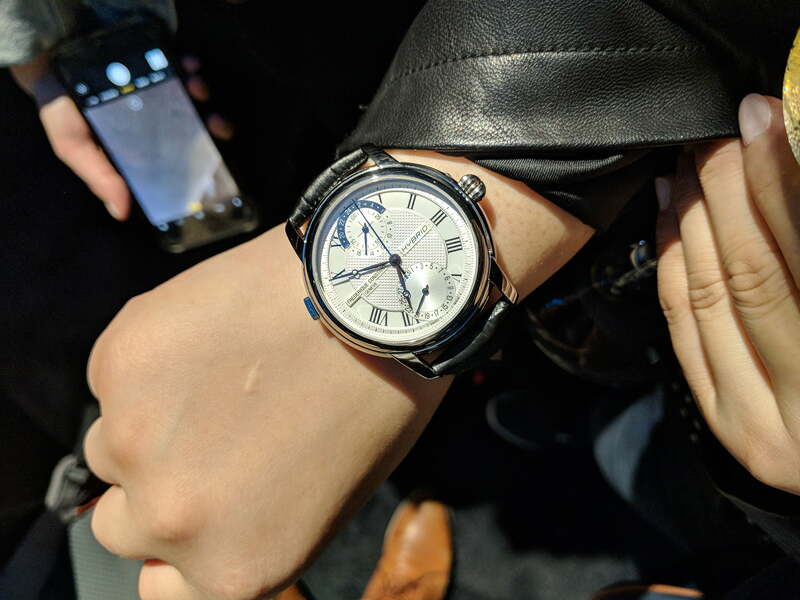 The Hybrid Manufacture is slated for a May or June release — the stainless steel colorway with a silver or navy dial will cost you $3,495 and the rose-gold is priced at $3,795. There’s also a limited edition option stainless steel model with a grey dial for $3,595 — but there are only 888 pieces available.